Plans by developer Neil Dipaola to place a makeshift village of 24 storage containers to be used by writers and artists, located on a 1.7-acre parcel in the city’s so-called Funk Zone off Gray Avenue, got off to an admittedly rocky start with City Hall, but relations have improved. City planner Bettie Weiss said she finds the concept “exciting and creative” but acknowledged she was upset to find out what Dipaola was planning via the blogosphere. Other city officials heard from other sources ​— ​some from elected officials lobbying on his behalf ​— ​but none from the developer himself. Given that Dipaolo has been working behind the scenes to smooth the way for a four-story mega project on the same site, this lack of communication proved more than a little nettlesome. Since then, Weiss said, she, Dipaola, and Mayor Helene Schneider have met several times to discuss the permit requirements. 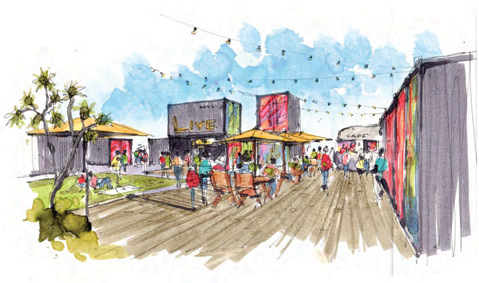 In recent days, the developers announced the names of the winners of a creative contest to secure occupancy of the storage containers in the proposed village. Two are writers for The Santa Barbara Independent, Ethan Stewart and Charles Donelan. Stewart said his plan is to document unfolding changes in the Funk Zone ​— ​both good and bad ​— ​while occupying one of the last remnants of ungentrified space. Donelan would open his space as a cultural resource to the community of artists, offering critiques and helpful hints on getting news coverage. Long term, Dipaolo has much bigger fish to fry. He’s proposing the construction of a four-story structure with 64 apartment units, a hotel, and a restaurant, not to mention square footage dedicated to outdoor and ocean uses and commercial-industrial arts applications. “It’s very interesting and creative,” said Weiss, “but it’s also very aggressive.” Making his proposal especially challenging, the land is zoned for only three-story development. In addition, Dipaola is offering to build only one-half the parking required. And of the 64 units, he’s only proposing to make 10 of the apartments affordable. “That’s not a lot,” said Weiss. Even so, his plan was designed in accordance with the state’s bonus density program that gives added rights to developments offering smaller and affordable units. That extra density gives him the additional square footage to justify the fourth story. The proposal is still in the conceptual stage, getting the once-over last week by the city’s Planning Commission. While many from the arts community showed up to voice their support, commissioners grappled with the state density rules and how they worked for this project.